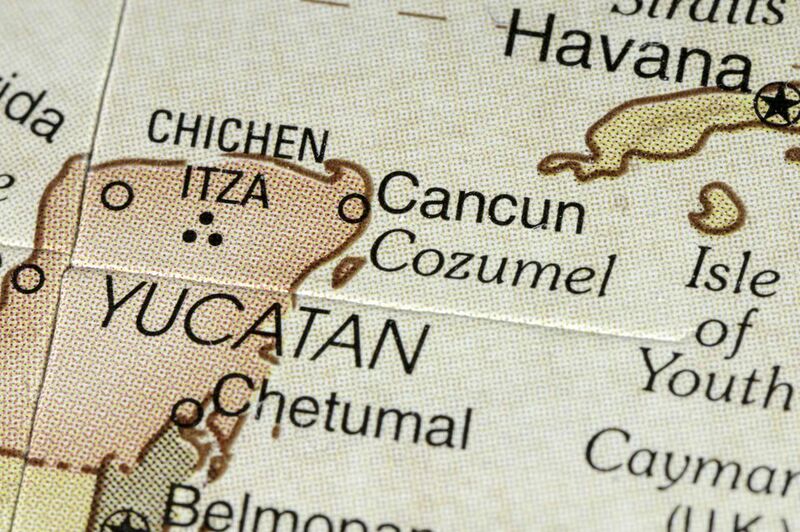 Situated between the Gulf of Mexico and the Caribbean Sea, the Yucatan Peninsula is comprised of the Mexican states of Yucatan, Campeche and Quintana Roo. With world-famous archaeological sites, enchanting colonial cities, romantic haciendas and resorts, beautiful beaches and a distinct cuisine, the Yucatan Peninsula is a great vacation destination. This one-week itinerary will allow you to experience the best of what the area has to offer, spending days 1 to 3 in the colonial city of Merida, visiting Chichen Itza archaeological site on day 4, and the remaining days enjoying the beach in Cancun. Merida, in the state of Yucatan, is a colonial city with a different feel. Known as the "White City," because of its buildings made of white stone and the city's cleanliness, Merida was founded in 1542, built on top of the Maya City of T'ho. The city has many attractive colonial buildings, many of the most impressive are along tree-lined Paseo de Montejo. Any time of the year you will find there are many choices for cultural events, concerts, theater productions, and art exhibits. The weather in Merida is hot and humid most of the year, so be sure to pack accordingly. Fly into Merida's international airport (MID). Day 1 - Get to know Merida city with a walking tour, or alternatively on a double-decker sightseeing bus, or by horse-drawn carriage. Then visit the Museo de Antropologia (Anthropology Museum). Day 2 - Go on an excursion to Uxmal, a Mayan archaeological site. Day 3 - Take a day trip to Celestun National Wildlife Refuge to see the flamingos (the best time of year for flamingo viewing is from March to August). Chichen Itza was the center of Maya civilization between 750 and 1200 A.D. It is considered the most important Maya archaeological site, although, on your visit to this area, you will soon realize that it is just one of a great many sites. Chichen Itza is located between Merida and Cancun, about an hour and a half drive from Merida and two hours from Cancun. You can either rent a car or take the ADO bus to get from Merida to Chichen Itza. Day 4 - Depart Merida heading towards Cancun, visiting the impressive archaeological site Chichen Itza on the way. Take a tour of the archaeological site and spend some time contemplating the ruins. You may also like to visit the Cenote Ik Kil for a refreshing dip before you continue your journey to Cancun. Cancun, on the Yucatan Peninsula in the state of Quintana Roo, is Mexico's biggest and most popular resort area. With stunning beaches, luxury hotels and resorts, fine dining, impressive Mayan archaeological sites nearby, and activities for all ages and tastes, it's no wonder 3 million tourists visit Cancun each year. Getting there: Cancun has an International Airport (CUN), but if you're coming from Merida (200 miles away), you'll want to come overland so you can visit Chichen Itza on the way. Day 5 - Enjoy the Mesoamerican reef, the world's second largest coral reef by going on a scuba diving or snorkeling excursion. Day 6 - Take a day trip to Tulum, a beautiful archaeological site on the coast south of Cancun and Xel-Ha, a water theme park. Day 7 - Take it easy on the beach. Enjoy a piña colada or other refreshing drink. Refine your sandcastle building skills.